In 2018, we took a trip through New Mexico (our second favorite state!) to visit White Sands National Monument and Roswell. Having spent so much time traveling by car and without a kitchen, we’ve found a way to prepare food and eat healthily while in motel rooms (more on this to come in a later post), so that we don’t have to dine out for every meal. However, just because we come prepared, we still make a point to experience local dishes and delicacies. 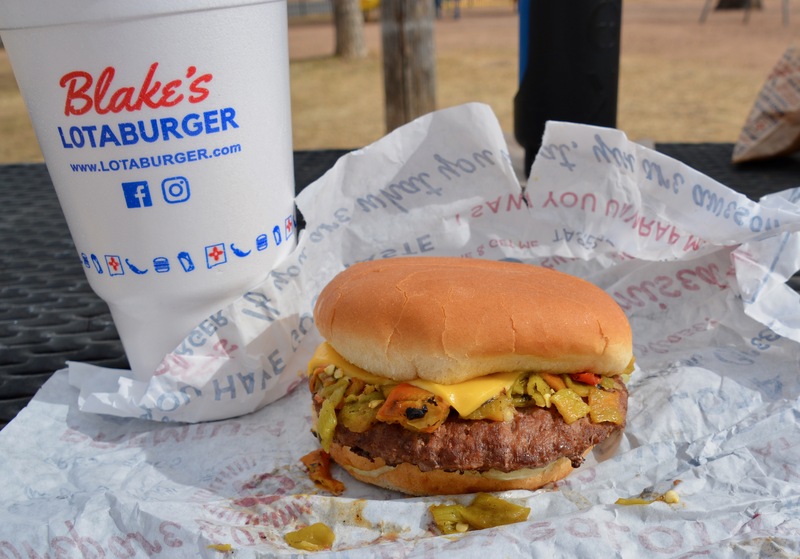 Well acquainted with green chiles from many visits to New Mexico, we couldn’t pass up an opportunity to undertake the Ultimate Green Chile Cheeseburger Smackdown. 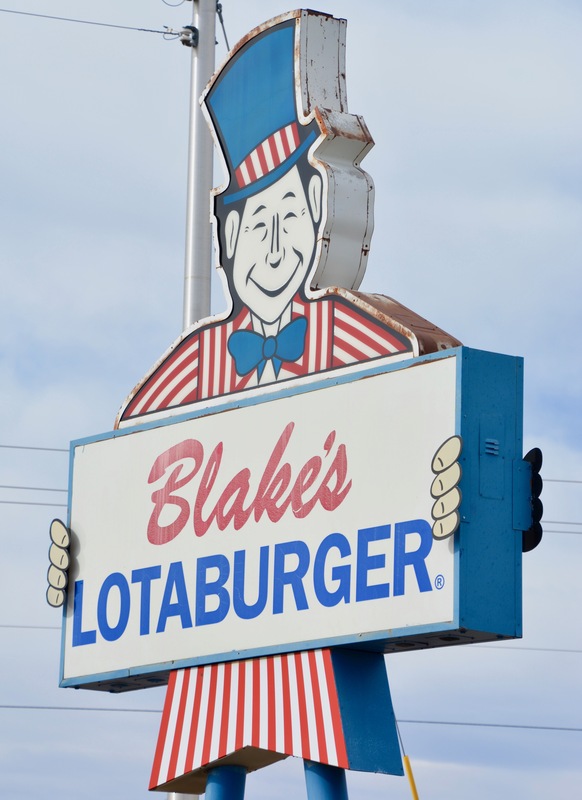 A staple of fast casual dining in New Mexico, Blake’s Lotaburger has been serving tasty burgers, shakes, and breakfast burritos to locals and visitors since 1952. 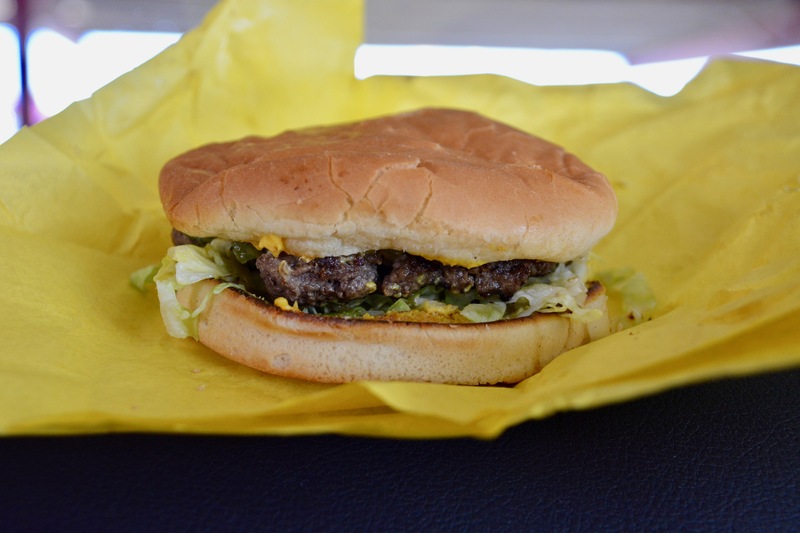 With more than 70 locations, most of which are in the Land of Enchantment, it’s hard to miss a Lotaburger when traveling throughout the state. Named the “World’s Best Green Chile Cheeseburger” by National Geographic and the “Best Green Chile Cheeseburger in New Mexico” by USA Today Readers, a stop at Lotaburger was the perfect way to begin our Ultimate Green Chile Cheeseburger Smackdown (which conveniently was the perfect distance for lunch on the day we left home). 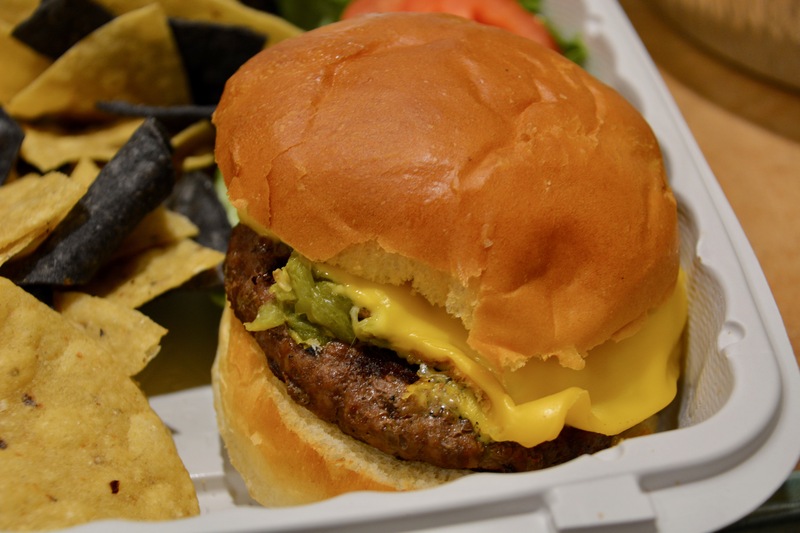 Spilling green chiles as it is unwrapped, the LOTA Burger with Green Chile and Cheese is picture-perfect with a fluffy bun sitting atop a pile of green chiles topped with American cheese and accompanied by tomato, onion, shredded lettuce, pickle, and mustard. Perfectly cooked to a medium temperature, the burger has a nice green chile flavor with medium spice. Looking back at our notes, Jay commented that he wished that it had more cheese, while Jen was delighted with how the burger didn’t feel heavy or sloppy, as we were expecting. On a “side” note, the fries were a touch on the soft side, but had a well-balanced amount of salt and plenty of good flavor so that they didn’t need any ketchup. In fact, the whole meal was so tasty that we’re now sitting at the desk dreaming about our next Lotaburger and we’d be lying if told you that we weren’t seriously considering getting in the car and driving to the nearest one this weekend (it’s in Taos, by the way). As lovers of Americana, we couldn’t pass up the opportunity to stop at a real drive-in for our second green chile cheeseburger. 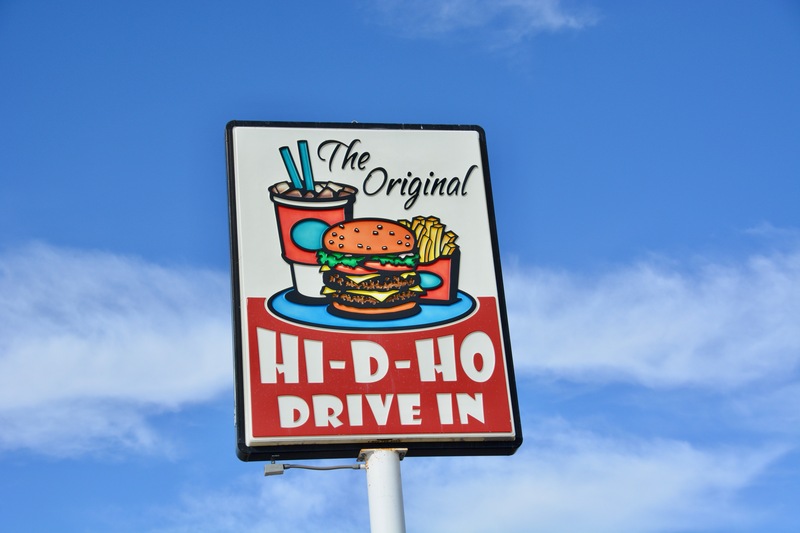 The Hi-D-Ho in Alamogordo (also home of the World’s Largest Pistachio) has been in business since 1952 and been voted the “Best Cheeseburger in Otero County” for more than 20 years. Famous for their Tiger Burger, a double meat patty cheeseburger with mustard, lettuce, pickle, tomato, and onion, the food is made-to-order and definitely worth the wait. After giving our order to the carhop from the comfort of our car, we received our burgers and fries after 20 or so minutes. Despite the fame of the Tiger Burger, we each opted for a regular burger which came with mustard, lettuce, tomato, pickle, and then added cheese and green chiles as extra toppings. A larger-sized patty of good quality, the burger was a bit more overcooked than our preference (no pink), but still had a nice beefy flavor. The toasted bun had a slight, pleasant crunch and the roasted green chiles added heat, but only a minimal amount of flavor. While none of the flavors stood out, the bites that included the pickle were delicious and made this burger a serious contender in the smackdown. It’s hard to imagine having a favorite Mexican restaurant in Santa Fe and believe us that it wasn’t an easy task to choose one, but it was certainly a fun one. After much research over many visits throughout the last decade, we’ve chosen a winner, La Choza. Located in a former bunkhouse for ranch hands near the hip Santa Fe Railyard, La Choza is owned by the same family that started (and still runs) the James Beard-award winning local favorite, The Shed. Warm, friendly, and with a dog-friendly patio, we always make sure to have a meal at La Choza whenever we come to town. While our standard order from La Choza is the Carne Adovada (which of course we ordered), we decided that trying a green chile cheeseburger from our favorite Mexican restaurant in Santa Fe made sense and would serve perfectly as a starter course. Topped with American cheese, green chiles, tomato, and lettuce, the burger was well-seasoned and the fluffy bun just the right amount of bread. Despite a lack of condiments, which it didn’t need, the burger was incredibly flavorful thanks in part to the medium heat and flavor of the green chiles. The simplicity of this burger was its winning virtue, not over-complicated or over-dressed, the flavors of each component were evident and worked in harmony to create a tasty burger that may have to become our new “appetizer” on future visits to La Choza. Now that you’re starving and figuring out how quickly you can get to New Mexico to eat green chile cheeseburgers, you probably want to know which was the best one we ate. While all were tasty and we’d go out of our way to eat any of them again, the winner was the Green Chile Cheeseburger from Blake’s Lotaburger. Clearly when the masses spoke and voted Lotaburger home of the “Best Green Chile Cheeseburger in New Mexico”, they knew exactly what they were talking about.